TalentLMS is a fast, easy and modern solution for businesses and organizations. The system features an upbeat personality with gamification features, ecommerce tools, visual reports and much more. Their services cater to very small to medium size organizations with options for larger businesses. TalentLMS offers a unique collection of features combined with a user-friendly design made for the modern professional. TalentLMS is a fast, easy and modern solution for businesses and organizations. The system features an upbeat personality with gamification features, ecommerce tools, visual reports and much more. Their services cater to very small to medium size organizations with options for larger businesses. TalentLMS offers a unique collection of features combined with a user friendly design made for the modern professional. 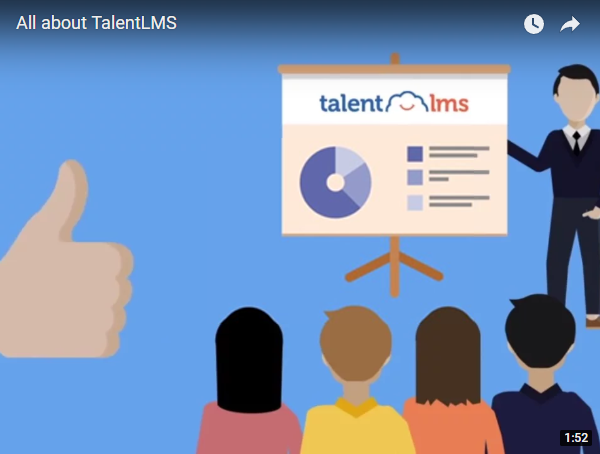 TalentLMS describes itself as a “super-easy cloud LMS” that can be used to train customers, students, partners or employees. The product looks promising, with customization options, cloud-based storage, mobile-friendly features and support for TinCan and SCORM. The company’s current client list includes many well-known businesses and organizations like the University of Arizona, ACL, Shopify, Telerik and cPanel. TalentLMS has a lot to offer, with a list of convenient features and an upbeat, positive atmosphere which is seen throughout the official website. New clients may be drawn in by the colorful design and happy-go-lucky personality of this LMS, but does it live up to their expectations when it comes down to functionality and customization? TalentLMS keeps things as simple as possible for clients. There’s no big setup process, no updates required and no need to backup data. Everything is handled via cloud so clients can breeze right through the technical aspects of LMS and focus more resources on developing effective course material to generate revenue and/or spread knowledge within an organization. The user gets the same basic features they would expect with other systems but without having to jump all the technical hurdles. Newcomers to the world of LMS may be put off by highly complicated interfaces that take time to understand. TalentLMS manages to present a professional looking design that caters to the needs of the less tech savvy. Inexperienced users will have no trouble figuring out how to build courses, monetize their curriculums or incorporate social media into their offerings. Everything is presented using colorful icons with clear labels. The result is an easy to navigate pathway to eLearning. Educators have more ways than ever to present information and instruction. TalentLMS takes advantage of that fact by allowing users to add a variety of media to their courses. Embed Slideshare presentations or YouTube videos to give students a better perspective. No extra code is needed to incorporate these elements. Search functionality for YouTube and Slideshare is built right into the course creation form. Users can also grab content form Wikipedia and other knowledge bases. Libraries can be created and maintained to give students the resources they need to succeed. Users can create file libraries then share those with learners. Photos, documents and more can be uploaded directly from the user’s computer or from an external URL. Once uploaded, the user can edit, share or download their library files. Users can create a branded look by adding custom appearance elements to their learning portals. Each portal can be customized on an item-by-item basis. Choose colors, themes and display options to give learners a completely unique experience that matches the business or organization. This is a great addition for companies that want to build brand awareness and monetize their courses. TalentLMS has taken the modern approach to reporting by offering data in concise, visual formats. The user can see key stats like number of assigned courses, number of completed courses and active user counts. Data is also displayed using colorful line charts that are easy to read at a glance. Custom report options are included so the user can tailor the data to their unique business needs. Playing a game sounds more exciting than going to class, which is why some LMS solutions have opted to include “gamification” on their features list. TalentLMS has done the same by allowing learners to earn points for completing tasks which leads to achieving levels and earning badges. Leaderboards are also included so students can “compete” to learn more. These fun “goals” can increase overall learning success and keep students motivated. Is TalentLMS Your Best Option? TalentLMS presents many exciting features for businesses that want an upbeat, modern educational solution. The interface is ideal for those who are new to the world of online learning but still offers enough customization and detail to appeal to seasoned professionals who have been in the business. TalentLMS seems to focus more on the small to medium size businesses with plans that are more budget-friendly than other LMSs. Their minimum accounts start with a cap of just 5 users and 10 courses. TalentLMS manages to present a system that works for a wide range of clients. The LMS already offers a number of appealingly modern features, like gamification, ecommerce tools and visual customizations. As more competitors get on the bandwagon, TalentLMS will likely have to come up with new innovative ways to stand out. In the meantime, the system has enormous potential and is designed to cater to a diverse audience. TalentLMS seems to have it all, from a user-friendly design to practical features that allow users to build a learning environment that is well-suited to their cause or purpose. They even managed to work in extra details that turn a typical virtual classroom into a fun, engaging place to expand knowledge. The plans mostly cater to small to medium size businesses, offering service for even smaller organizations than other LMS’s. Accounts for larger organizations (up to 50,000 uses) are also available. TalentLMS’s personalized, positive approach can help any organization or business take their eLearning to the next level. Do you use Talent LMS? – Write a Review!